"Clark Kent, How Would You Like to Meet Your Real Father?" As Superman is destroying an unstable Laser Defense Satellite (L.D.S. ), a system designed to defend Earth from laser attacks from space, General Daniel Webster Derwent, the mastermind behind the L.D.S., speaks of his resentment of the Man of Steel. Superman, in the meantime, is angry that the United States government kept the L.D.S. a secret from him. He listened to the Joint Chiefs of Staff's explanations, but they felt like evasive double-talk to Kal-El. A strange piece of space-jetsam has entered Earth's atmosphere. While scanning for more L.D.S. debris with his superhuman vision, Superman notices a warning of danger written in Kryptonian on the jetsam. The message says that micro-organisms deadly to all life forms are inside the craft. Superman notes that this Kryptonian object is not turning into Kryptonite while melting. Most elements from Superman's home world would become Kryptonite upon heating up as a result of the destruction of Krypton. Superman descends to Earth to follow the jetsam. It changes course to collide with the Man of Tomorrow, and it takes a humanoid form. The creature wants to unite with Superman. However, the collision of the two beings only results in the Man of Steel's unconscious form landing in the Atlantic Ocean. The Kryptonoid remains undaunted as he realizes that Superman is like the ones that had exiled it. The shape-shifting organism wants to punish the Man of Steel. The Kryptonoid has now landed on Mooney Island, where the secret lighthouse command center for the L.D.S. is located. It sees Superman and believes it can lure him to come into contact with the creature. It unites with a piece of a chain-link fence. Superman dismantles the fence. The Kryptonoid can now attempt to unite with the Man of Steel. But is the being that is lifting the fencing really Superman? The real Superman has just come out of the ocean with the debris of the L.D.S. satellite. General Derwent confronts the Man of Steel, who doesn't like the fact that the United States government lied to him under the general's orders. It's clear that Derwent hates Superman, and he explains to his assistant Gurney why. A few years ago during a weapons test in which Superman was a volunteer target, a tiny piece of shrapnel went into Derwent's left arm. Infection and blood circulation problems began to occur, and by the time the medics had examined the arm, Gangrene had set in. Derwent's arm had to be amputated. The general blames Superman for the loss and believes that the Last Son of Krypton should have taken precautions to prevent any damage. Gurney now expresses reservations about not telling Superman about the L.D.S. Had Kal-El not known about it, he may have been able to help defend the lighthouse base. Gurney feels that his men might not have been able to do anything against an L.D.S. attack. Derwent responds by saying that the base has its own Superman. Gurney and his men had found a dismantled Superman robot some time ago. Gurney wanted to contact Superman about it, but Derwent had ordered that the automaton be reprogrammed and rebuilt. The robot is hidden in a lead-lined shelter to hide it from Superman's X-ray vision. It is in the shelter now removing some chain-link fence. This was the Superman that Kryptonoid saw. The alien changeling has escaped the real Superman's detection by being in the shelter disguised as fencing. The Superman robot has just made contact with the fencing containing the Kryptonoid. The shape-shifting creature has begun the fusion process, and a new version of the life form is now born. Superman has returned to the Galaxy Broadcasting Building. In his Clark Kent persona, he dials a telephone number that connects him to the computers in his Arctic Fortress of Solitude. The computers tell him of Ser-Ze, a biochemist friend of Superman's father Jor-El. Ser-Ze wanted to use Kryptonian micro-organisms called Commensals in experiments to create new artificial limbs for those that had lost arms or legs. The Commensals could live on a host body without feeding off it like a parasite. Unfortunately, as the organisms evolved, they needed more room. Being a replacement limb was not enough for them. The Commensals began to add their hosts' bodies and minds to their collective consciousness through rapid evolution. They also had gained the ability to change their shape. The Commensals had set out to take control of Krypton and eventually killed Ser-Ze. In their efforts to stop the creatures, the Kryptonian police discovered that the Commensals are vulnerable to intense cold. Jor-El found the remaining microorganisms that Ser-Ze had not used in his artificial limb experiments, placed them in a refrigeration unit and shot them into space. Somehow, the Commensals were awakened when they reached Earth and took over the capsule in which Jor-El had placed them to become the Kryptonoid. The Kryptonoid has just encountered General Derwent. It convinces him to join his consciousness with that of the Commensals' collective. He agrees to do so in hopes of getting revenge on Superman. However, after Derwent's essence becomes one with the Kryptonoid, his body is destroyed. WGBS Anchorperson Lana Lang has just come in for work. She sees Clark Kent in the telephone booth. She has suddenly become frightened. Someone or something destroyed the booth with Clark inside. What actually happened was that the Kryptonoid moved at superhuman speed to attack Clark. Clark had seen the creature coming and moved outside a split-second before impact. Now in full Superman costume, our hero is in the skies confronting the Kryptonoid, who mistakes the Man of Steel for Jor-El. The Kryptonoid uses his vision powers to make a traffic light pole wrap itself around the Last Son of Krypton. 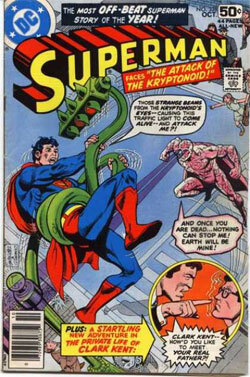 For some reason, Superman cannot break free of the unusual trap set by the creature. It stretches its hand out to touch Kal-El. This time, the Kryptonoid is intent on destroying Superman, and it looks like the Man of Tomorrow cannot escape his lethal foe. Story - 5: I don't know exactly what I expected from this book before I sat down to read it, but I'm surprised I liked it. The bulk of the story lets readers know what happened in previous issues and tells how the Kryptonoid came to be. There's only a few pages of the real Superman encountering his strange foe. However, like the first act of a film, stage play or TV episode, most of this comic sets us up for what will eventually happen in the next act - or in our case, the next issue. I only wish the powers that be had used all the pages in Superman #328 for "Attack of the Kryptonoid" instead of giving us a useless back-up story. (More on that later.) Still, I was entertained immensely by what they did use for the main tale. A lot went on in this part of the comic, and I can't wait to see how the rest of the story turns out. Art - 5: I was blown away by Curt Swan's visuals in this issue. The look of the Kryptonoid's changes, and everything else in this book for that matter, is simply stunning. The scene with the possessed Superman robot meeting General Derwent was classic Swan. Seeing his art makes me wish more Superman artists could pull off what he did. Private detective Jeff Landis approaches Clark Kent while he's having lunch with Steve Lombard and Jimmy Olsen in the WGBS cafeteria. He asks Clark to roll up his right sleeve. Kent does so and reveals an hourglass-like birthmark on his arm. This mark is the lead Landis needs to solve the Linden kidnapping. Millionaire architect Robert Linden's young son was kidnapped years ago and brought to the Smallville orphanage around the same time the Kents found Clark and placed him there so they could legally adopt him. Linden's wife died shortly after the police failed to find the boy, and Linden himself doesn't trust policemen after they didn't bring his child home to his family. Linden also became a recluse after the kidnapping. After talking in Clark's office, Landis takes Clark and Steve to the Linden Estate. Unfortunately, Linden will only allow Clark and Steve into his home because he doesn't trust lawmen of any kind, even private investigators. Clark, however, refuses to enter the house without Landis. Linden reluctantly decides to walk with Clark and the others around the estate grounds. Clark gives Robert Linden all of the proof needed to convince the architect that he is his son. He even tells Linden of the stuffed red elephant that the Linden baby had as a favorite toy. It was with the boy when he was kidnapped. Suddenly, Matthew Curtis, a former business partner of Linden's, pulls a gun on the group. Linden sent Curtis to jail after learning that he'd used inferior construction materials, and Curtis vowed revenge on the millionaire recluse. Curtis removes his chauffeur's disguise and is about to shoot Linden when a flash bomb in Jeff Landis' jacket blinds the gunman. Landis then knocks out Curtis while Clark secretly uses his super breath to take care of the men working for the villain. After Matthew Curtis and his crew are dealt with, Robert Linden learns the truth. Police officer Jeff Landis is actually Linden's son. He had grown up with Clark in Smallville and told the TV anchorman his story. Clark knew of Linden's distrust of law enforcement authorities. He put the same birthmark on his right arm that Jeff has in order to talk to Robert Linden. Both Jeff and Clark knew of Curtis' attempt on Linden's life. They came up with this plan to save Linden's life. Robert Linden shows pride in his son as Clark and Steve leave to return to WGBS. Back-Up Story - 1: Why in the heck were trees sacrificed to print this story, and why in the name of Rao wasn't the Kryptonoid continued until the last page of this comic book? I like stories about the Pre-Crisis Clark Kent of the Julius Schwartz era, but this back-up seems like a bad episode of any soap opera you can think of. The only thing missing is cheesy organ music while some narrator says, "Will Mr. Linden find his son?" Dental surgery is less painful than this garbage. This one made me miss the Bruce Jones' run on The Incredible Hulk, and I hated that more than the Spider-Man Clone Saga of the 1990s. Skip this tale, and move on to the next issue, folks. Back-Up Art - 3: The art isn't bad. However, nothing really sticks out in my mind. It tells the story, but that's about it. If this tale had been written better, maybe the images would have impressed me more. 1. The art has to be good. 2. The image has to make me curious about what's going on inside the comic book. The cover for Superman #328 fits both of those requirements a thousand times over. It just needed some things taken away in order to get a rating of five.